Recent release “Transition – There is no Death!” from Page Publishing author Janie McCorkle is a potential place to turn for readers seeking alternative views of the workings of the world. 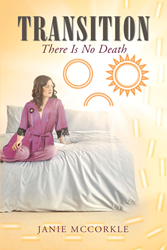 Janie McCorkle, a medium for the Holy Trinity whose gifts are shared the world over, has completed the new book “Transition – There is no Death!”: a story that begins in grief but ultimately attempts to bring peace into the lives of all. Published by New York City-based Page Publishing, Janie McCorkle’s personal tale picks up where her mother’s life, and time as a clairvoyant, left off. In the years of her childhood and into adulthood, Janie worked toward achieving a more harmonious spiritual arrangement with herself as the medium between this world and the eternal. Readers who wish to experience this uplifting work can purchase“Transition – There is no Death!” at bookstores everywhere, or online at the Apple iTunes store, Amazon, Google Play or Barnes and Noble.